Timberkits self-assembly Mermaid Kit , all parts fully machined, just peg and glue and make it move. 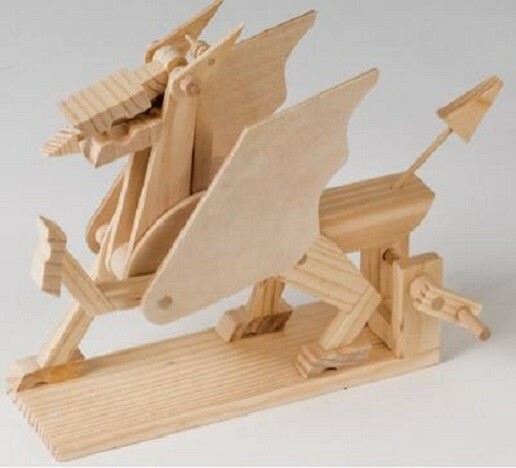 A series of crank operated linkages enable the dragon to lunge forward, opening his jaws, with the tongue moving forward in a dramatic fashion. Just turn the handle. Amaze your friends! - no special knowledge or skills needed. After you have made the model you can paint and varnish it and then try a more difficult one! For ages 9-90years. The kit includes: Wooden components, shaped and drilled. Sandpaper to improve finish where occasionally necessary. PVA glue. Parts List. Comprehensive instructions. Hints on painting and decorating your model. The wooden kit is made with New Zealand pine, which is sustainably sourced, gives a precise finish, a pleasant feel and a warm natural colour.